Joy Martin spent the day at Watch Out, a day-long festival of performance at Cambridge Junction featuring new work from Lucy McCormick and Igor & Moreno. On Saturday 23 May 2015 the Cambridge Junction presented Watch Out, a day-long festival of contemporary performance which follows in the footsteps of their previous festivals Night Watch and Sampled. I studied the line-up ahead of time, and it was interesting, as always, to consider the different dimensions of theatrical experience: The Before, The During, and The After. When I was looking at the programme during The Before, I was excited and curious, and aware that this flat piece of paper with its marketing words and images would become something else – something large, 3D, and stuffed with glitter, humanity, sound and significance in The During. And I knew that in The After, some of the ideas would take root in my being and reconfigure my understanding of myself and the world around me. And that felt like the distinguishing curatorial impulse behind the festival: to explore the power of new ideas and the way they radiate through performance. And in this Watch Out was a roaring success: every single show had a steely, spiky, sharp, bright or brilliant idea around which the performative elements cohered in riotously inventive and engaging ways. Many of the shows were previews or premieres, so there was a newness and rawness to some of them, but it was a testament to the quality of the assembled performers that they all delivered artistically. There was a range of different types of performance – theatre, dance, spoken word, burlesque, music, digital – and so often in this historical moment genres tangle together in fascinating ways. To some extent, most of the shows were tangles, but with a predominating performance type. Two of these pleasing tangles were A Room for All Our Tomorrows by Igor and Moreno and Swagga by Project O with Charlotte Cooper and Kay Hyatt. Both came under the category of dance in the programme, but they both incorporated sound, singing and spoken words. Swagga was the first show I saw, and it was an interesting study of the themes of fat, femininity, otherness and acceptance. The performance felt like the second hand of a clock, sweeping around the angles of the issues one by one and arriving at a conclusion where roundness and largeness finally cast off society’s aspersions and recall the goddess aspect of femininity. I particularly enjoyed the spoken word elements of the show and the song lyrics, which were poetic and deeply affecting. This show didn’t completely coalesce, in the sense that its different explorations felt slightly unconnected to each other, but it was powerful and engaging. A Room for All Our Tomorrows is one of the shows that is still glowing brightly in my imagination. Maybe that’s partly because Igor and Moreno’s production team have such a strong grasp of the craft of light and staging.In a warmly-lit space with a stylish, square wooden table and chairs, over coffee, Igor Urzelai and Moreno Solinas use movement, sound and singing to portray the elemental cycles that move through relationships as two people trigger fury, frustration, and finally healing, in each other. The set and costume design by Kasper Hansen created an Ikea-esque ideal appearance and environment for the two characters in this piece, against which the real tensions that arise in an intimate relationship poignantly raged. 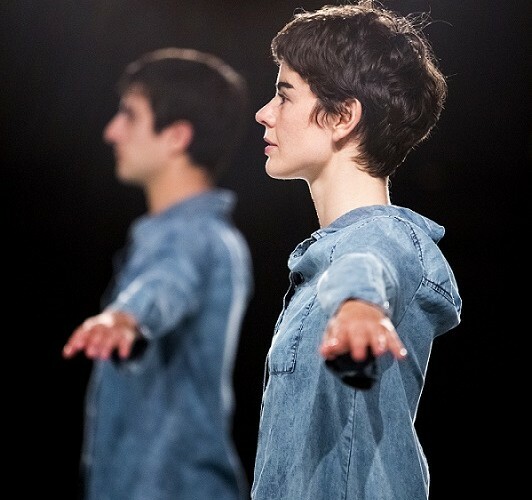 As artists, Igor and Moreno are interested in exploring catharsis through live performance, and the way they expressed frustration – by a ‘conversation’ of grunts and screams – had the audience falling apart with laughter … and probably sent everyone home infused with a greater degree of humorous compassion for their own relationships. It was a pure, unadulterated delight. Watch Out balanced the different flavours of artistic transmission well and programmed an engaging set of spoken word, burlesque, digital and live art in contrast to the more abstract explorations of the dance shows. The poet Rowan James gave a preview of his new show Easy for You to Say, which is spoken word refracted into different forms – poetry, storytelling and rap – in collaboration with beatboxer Marv Radio. It was an energetic and intelligent show about the question of ‘normality’ and perceptions of ability via James’ personal story of being diagnosed with a disability. Some of the word formulations were incredibly beautiful – proper silvery poetry, deep and bright, and I really enjoyed it. The Cube by digital arts company Circa69 was one of the most surprising and exciting shows at Watch Out, and everyone was talking about it. It was a one-on-one performance with the artist, Simon Wilkinson, the director of Circa69, where I was fitted with the Oculus Rift, a virtual reality headset designed for 3-D gaming. Here it was turned to the purpose of engineering an artistic encounter in a new world, and it blew my mind, with its newness, the Dali-esque imagined American desert that appeared around me in a small room upstairs in the Junction, and a compelling story. My favourite show at the festival was Show Off by Figs in Wigs, a group of five conceptual artists who are all women – Rachel Gammon, Suzanna Hurst, Sarah Moore, Rachel Porter and Alice Roots. I’ve been hearing great things about them for years, but I have always managed to narrowly miss seeing them (because of, um, either lateness or drunkenness, as at last year’s Night Watch festival). And when I say, ‘I’ve heard great things’, I mean that I’ve seen the people saying the great things come out at the end of a show, and they are sort of glowing phosphorescently with irrepressible smiles and look like they are about to break into song and dance, and their eyes are darting around looking at the world faster than usual because their minds have been so deliciously stoked. Now that I’ve finally seen a Figs in Wigs show, I understand why that is. They are a real riot. Show Off is ostensibly a burlesque, with silly, glitzy costumes, jokes, songs, dances and a very impressive hula-hoop sequence, but underneath all of this, it’s a highly intelligent Theatre of the Absurd. They are aware of this, and the show contains the telling line: ‘If you want to go deep, you must first go shallow’. Show Off is deeply self-reflective, as if the five girls are peering at themselves as they peer at themselves, like those halls of mirrors with endless reflections. The theme they are self-reflectively studying is … self-reflection (in art and social media). It was rich, wild, lushly comedic, absorbing and fascinating. Another highlight was a new show by an old favourite – Lucy McCormick from GETINTHEBACKOFTHEVAN, doing a premiere of a show called Calendar Girl. When I was looking through the festival programme, I saw the show listed and read, ‘Lucy McCormick presents this late night performance as part of a biblical series in which she casts herself as Jesus Christ, in an attempt to find greater connection to her own moral conscience’. So I was already chuckling at this, days before, and also wondering how this theme would play out within Lucy’s favoured live art performance techniques of nakedness, shock, profanity and pop power ballads – and she didn’t let me down. In fact, the show was about ascension – the Ascension of Jesus Christ. The show was sharply feminist, as much of GETINTHEBACKOFTHEVAN’s work is, and it was also shockingly sexually graphic, but as in her previous work, there is one bomb blast of a theatrical moment when a profound concept crystallises. It was the moment where Lucy did something pornographic with her body, the woman standing next to me walked out, and I thought, ‘huh – that’s a fascinating way to ironically depict Christianity’s relationship to, and devaluing of, older goddess-based religions’. It was a hilarious, shocking and profound show, which is what I have come to expect from Lucy McCormick. As I look back, I realise how confident I was at the start that Watch Out would be excellent, and I was right. You know how sometimes you have friends who are a sure thing? How there are these solid, encircling parameters that deliver awesome results every time you see them? Like, every time, the conversation is a delicious mixture of funny and deep. Every time you feel relaxed, warmed and nourished. Every time you lose track of time because you’ve entered some charmed space together. I feel this way about the Cambridge Junction’s programming of contemporary performance under Artistic Director Daniel Brine and Arts Producer Daniel Pitt, who was the lead curator for Watch Out. Although the encircling parameters are slightly spikier, and they have a different purpose: to challenge me, shake some of the broken ideas out of me, reflect me, light me up and give me something new to think about. In The After dimension, I walked out grateful, light-hearted and soaked in new ideas. Joy is a writer based in Cambridge. Originally from America, she has lived in the UK since 1998. In addition to writing for Exeunt, she is working on her first novel with the support of a grant from Arts Council England. She also writes the blog mirrorlamp.co.uk. Her favourite things in life are books, yoga, meditation, discos and every kind of artistic expression.